The following are artworks I have handprinted. All details specific to each print are listed under each image. If you are interested in further information regarding my prints and their availability please contact me directly through my website on the About/Contact page or by emailing my studio at studio@fionajappy.com and I will reply as soon as I can. Please be reassured that any details you provide me with are solely used for your enquiry and are not used for any other purpose. 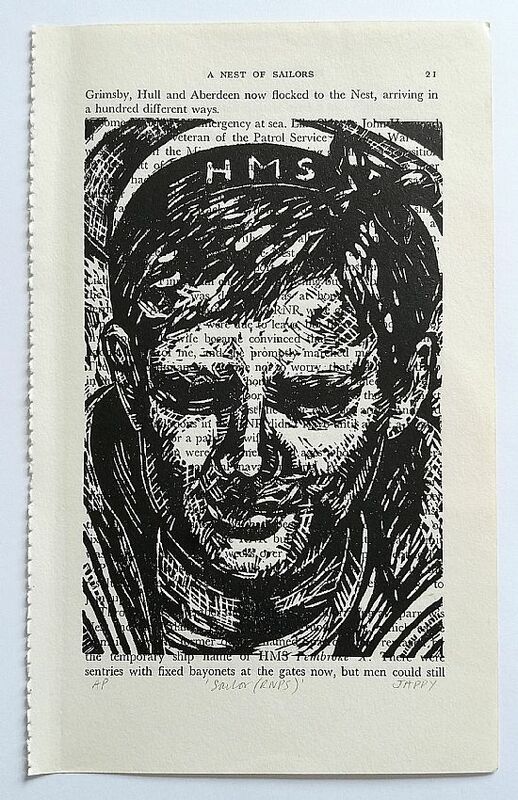 This linoprint is my first sailor print which pays remembrance to the 2385 men of the Royal Naval Patrol Service (RNPS) who were lost at sea during WW2, and who never made it home. These men are still at sea and so the edition size of this print has been specifically chosen to pay remembrance to every one of these men. 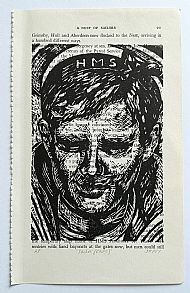 The linoprints are printed on to the vintage book pages of 'Trawlers Go to War' providing history of the RNPS and true testimonies of life as a serviceman in WW2 serving on small boats such as trawlers. Each print is uniquely different, due to the text on each book page and to the artwork being handprinted. As a result there may be tiny variations between each print. Individually printing each image without a printing press, and using a wooden spoon, can result in tiny imperfections, as is the nature of handprinting. I think this adds to the beauty and uniqueness of each print. The book pages are also vintage and are not in pristine perfect condition. They may also have slight imperfections to them but each page that I use I ensure that I am happy with the finished print and that I would be happy to display it on my wall.